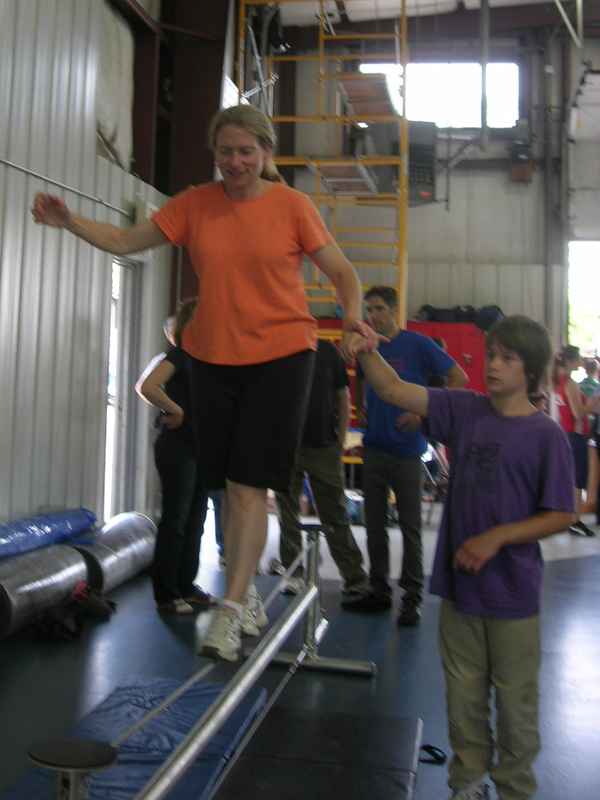 When the Goodman Community Center opened in 2008, its gymnasium became a “meeting of minds” as well as bodies of locals interested in circus skills. 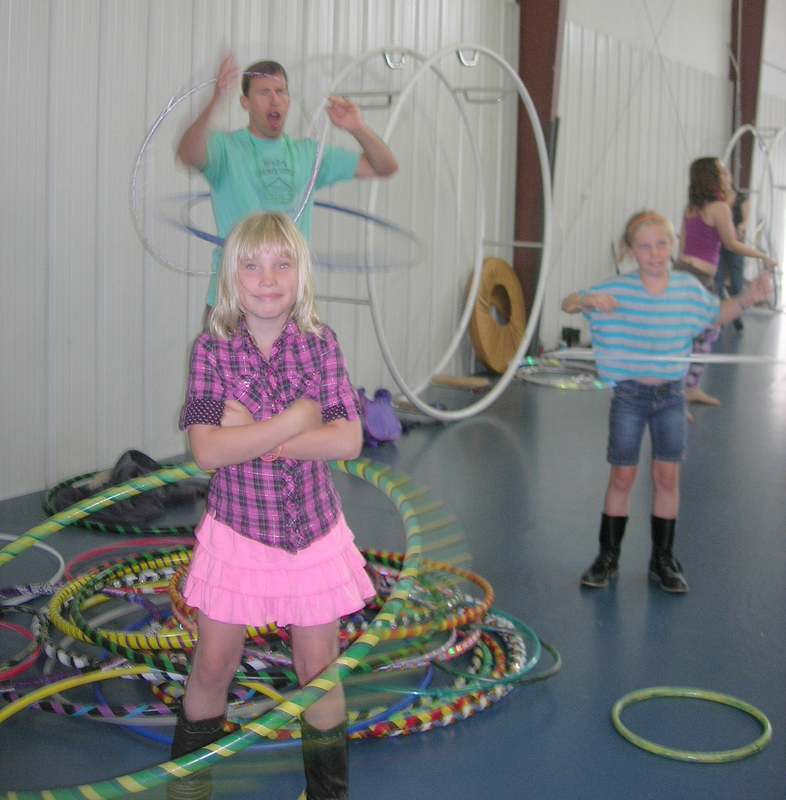 Clubs of jugglers, unicyclists, aerial dancers, and fans of circles from Hula Hoops to German Wheels came together on Sundays to jam and learn new skills. But competition for space grew as the Goodman Community Center hosted more and more activities. 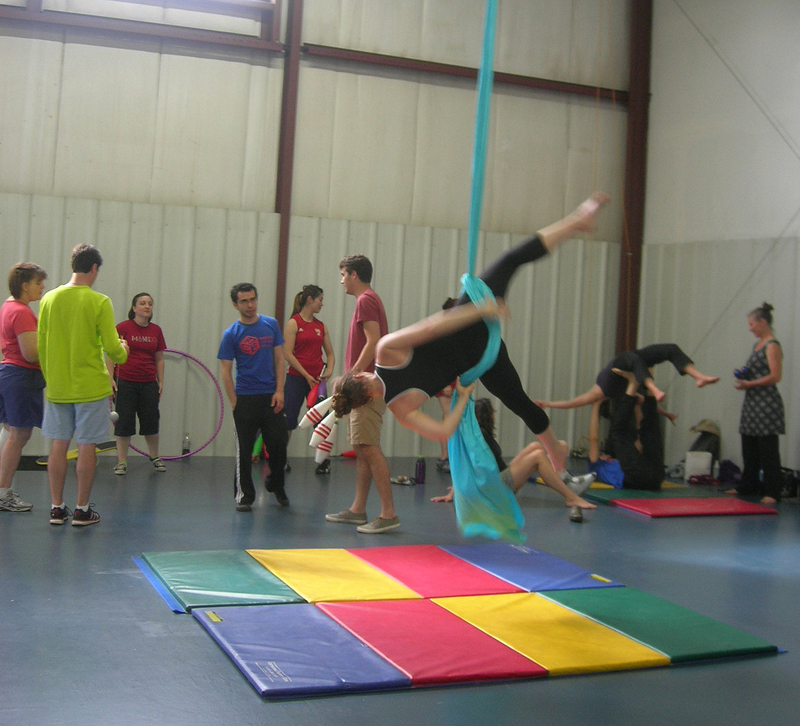 “There just wasn’t enough available practice time,” said Marcia Miquelon, Aerial Rigging Coordinator and instructor at Wild Rumpus Circus Camps, one of the founding members of the Madison Circus Space. 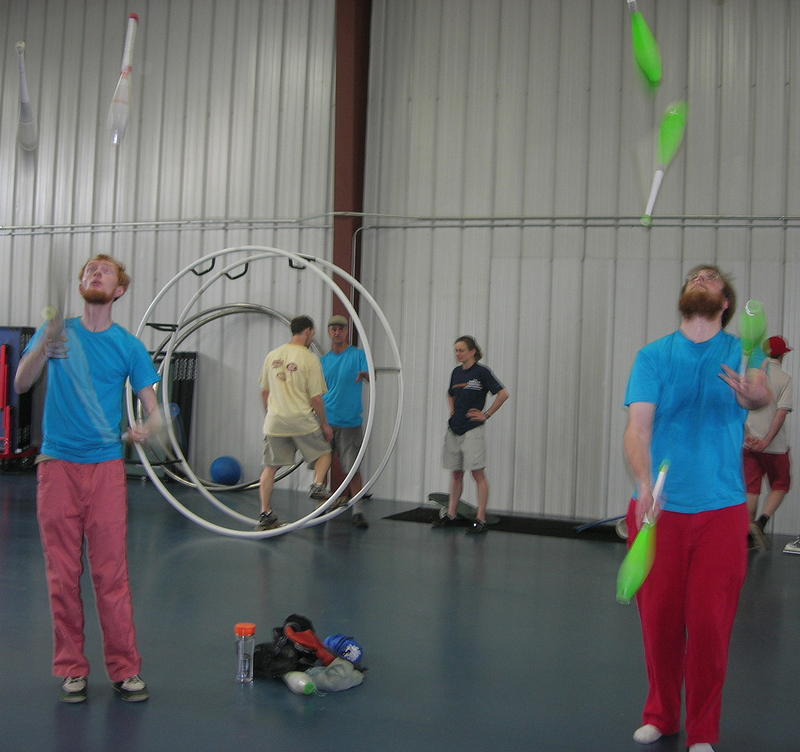 A Kickstarter campaign provided much of the financing for the Madison Circus Space, raising $13,485. 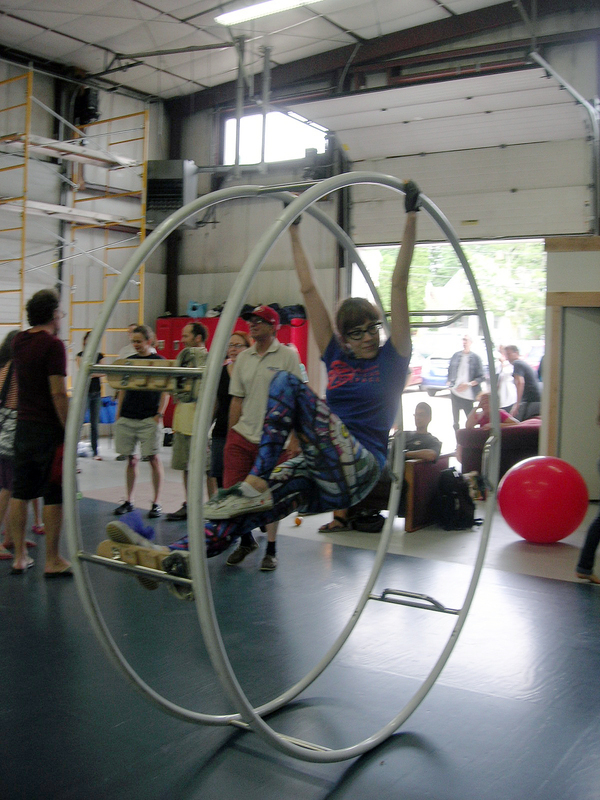 Carly Schuna, German Wheel instructor and secretary of the Madison Circus Space board described pledge rewards ranging from “t-shirts to circus performances in your own back yard to bathroom naming rights.” “Everybody’s jazzed about how the campaign turned out,” Marcia Miquelon said. 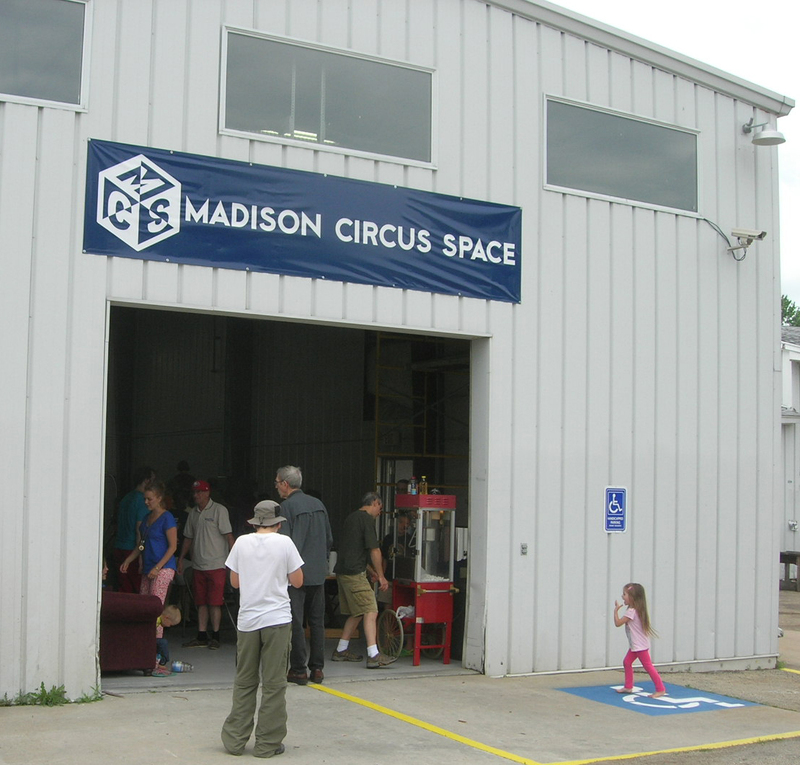 Madison Circus Space’s 4,500-sq. ft. interior features 22-foot-high ceilings and a floor transformed from engine bay to a floating wooden floor suitable for dancing. Tumbling mats add to the comfort. Additional bathrooms and exits were installed and the electrical system improved. 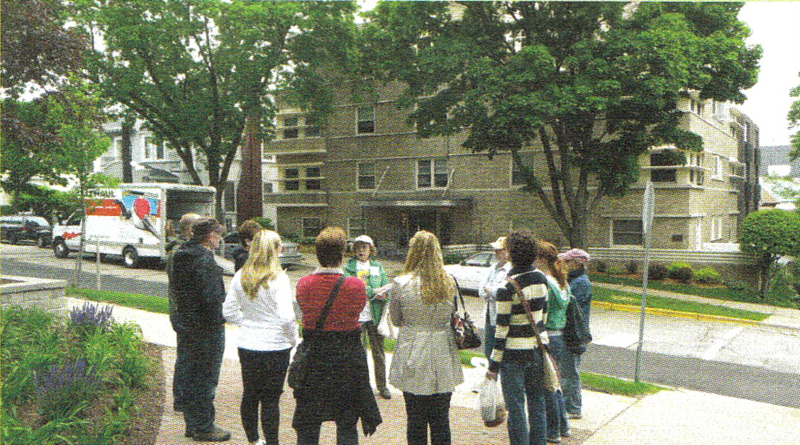 The East Side History Club’s roving reporter attended the Open House on June 29. Anyone interested in volunteering or supporting the Madison Circus Space financially can find more information on its website. The East Side’s circus connection is a long one. 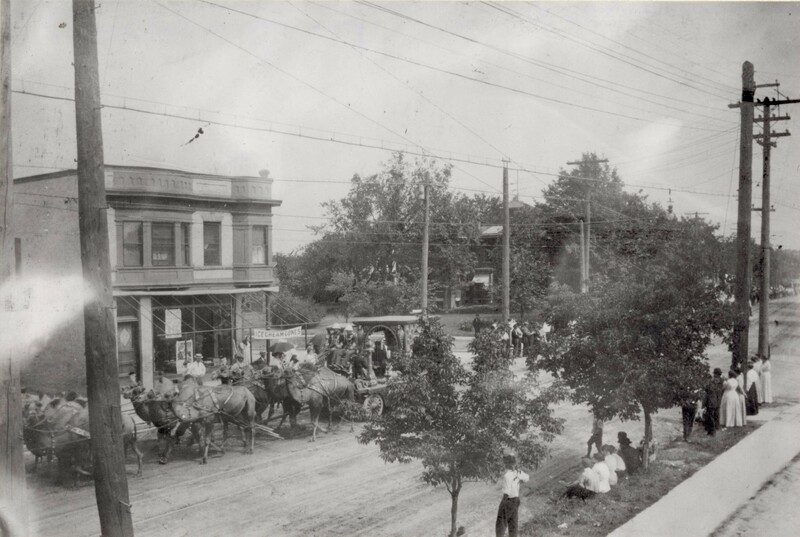 In the early 20th century “Circus Hill” was the name for the property where Lowell School now stands, because traveling circus troupes would pitch their tents there to thrill “children of all ages” with their performances and menagerie. A giraffe was once spotted hitched to the corner lamp post at Atwood and Elmside Boulevard while its master presumably shopped at the Hess Store next door, recalled Merrillyn Leigh Hartridge in the East Side Album. As the size of the traveling circuses grew, other East Side locations hosted the performances, including Burr Jones Field and vacant lots near Oscar Mayer and the Dane County Regional Airport. The numerous railroad tracks crossing the east side permitted the circus trains to unload near the circus grounds. Older people who grew up on the East Side remember watching the circus animals parading from the tracks to the circus grounds, and arriving early to help set up the circus tents in exchange for free tickets to the show. Circuses were the topic of the East Side History Club’s February 2011 meeting. A list of circus locations by year was posted on this blog. 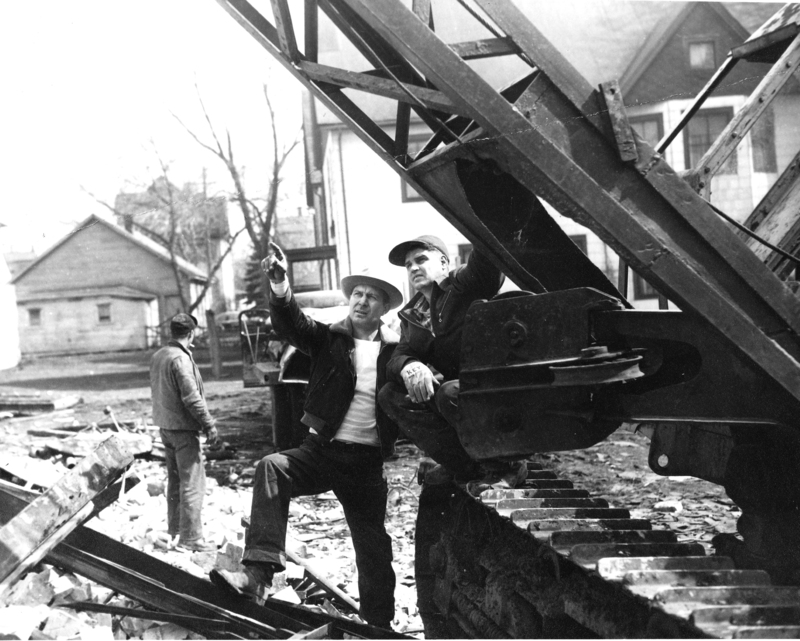 Artis Allen has given the East Side History Club nine photographs of her brother-in-law’s company, Allen Wrecking Co. that was on Pennsylvania Ave., tearing down Marquette School in April 1952.
the old Marquette school closed for good. for the new City-County Building downtown. The Willy Street Co-op remodeled the Eagles Club and moved into their new store in 1999. The pictures were taken by Wisconsin State Journal photographer John Newhouse. Some of them accompanied an article published in the newspaper on April 5, 1952. Lynol Allen pointing to what he wants Bill Johnson, the crane operator, to do. 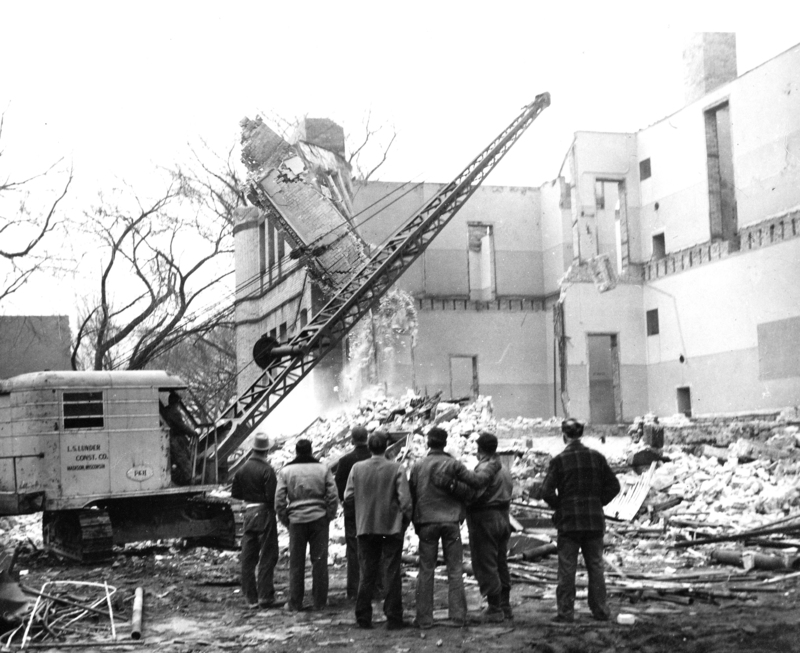 The house behind the crane is still standing at 1244 Jenifer St. and the tall house behind the barn-like building is at 413 S. Baldwin St.
Crane knocking down the Marquette School building. 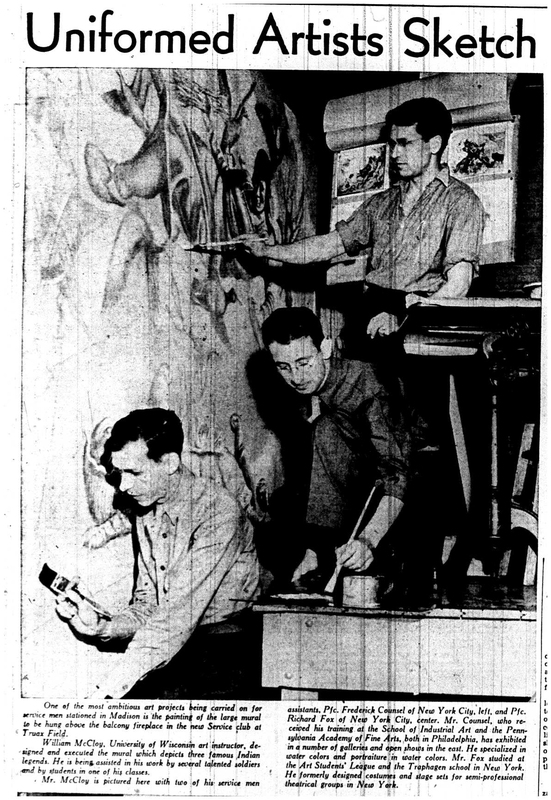 The man in the plaid jacket is identified in the newspaper as William Gutzmer, who lived at 1154 Jenifer St.
1943 Indian Murals from Truax Service Club/East High for sale in Cambridge! 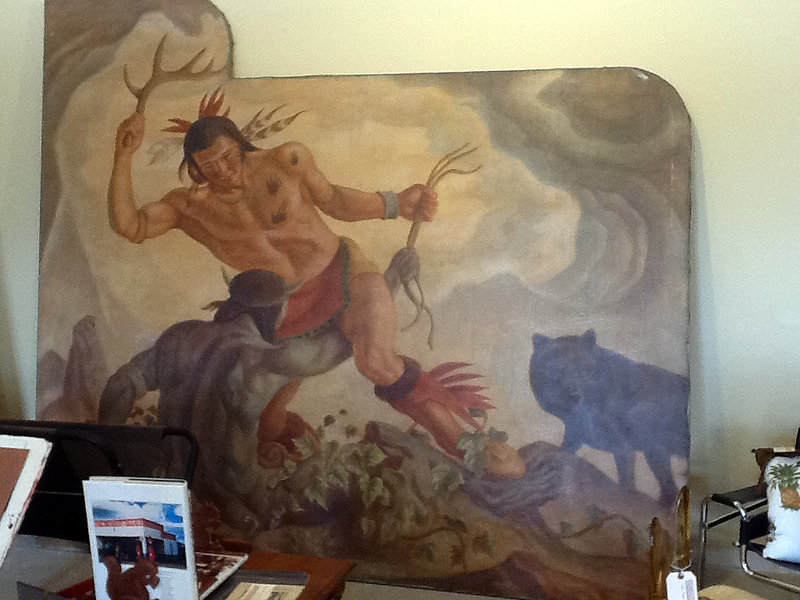 ESHC member Becky Wornson sent us a notice saying that the Cambridge Furniture Traders store in Cambridge has three large mural panels (8′ tall x 30′ long) for sale and did we know anything about them. Ann Waidelich found the following article in the Wisconsin State Journal for April 4, 1943. “One of the most ambitious art projects being carried on for service men stationed in Madison is the painting of the large mural to be hung above the balcony fireplace in the new Service Club at Truax Field. Wisconsin State Journal April 4, 1943. Wiliam McCloy painted the Wisconsin Centennial Mural that hangs at the top of the north stairwell in the Wisconsin Historical Society library on campus. 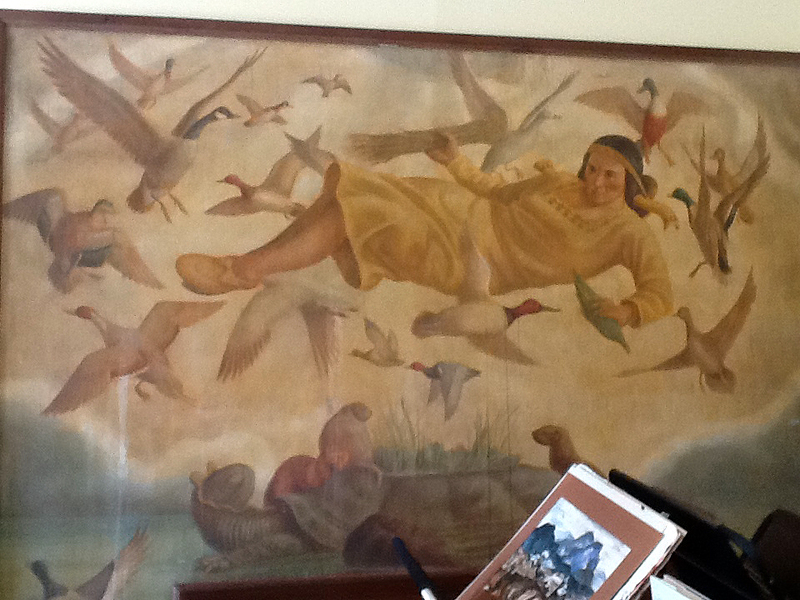 He left the UW to go into the service during WW II and spent most of his art teaching career at Connecticut College. He died in 2001. 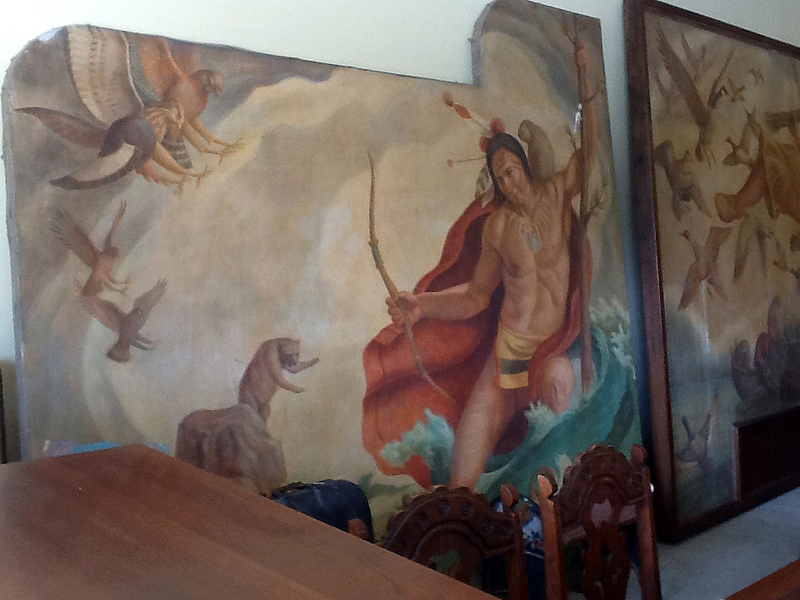 In the late 1950s the murals were taken out of the Service Club and given to East High School where they hung in the back of the auditorium until a remodeling in the 1970s. An East High School art teacher bought them and stored them. Now they are for sale. Do you remember them at East High School ? or in the Service Club at Truax? Looking for something historic to do this summer? Try being a tourist in your own town.